It’s a good idea to do a big purge of your makeup and beauty items twice a year. You will probably be changing your makeup with the seasons anyway so now is a good time to spring clean and organize your beauty products. I love trying the latest beauty items but I only have so much storage space. I try to keep to the rule of one in and one out but that can be easier said than done. My bathroom drawers have become overrun with makeup and beauty products that a good spring cleaning was in order. By keeping to a semi-annual schedule of cleaning and organizing your beauty products, you will save so much time as well as money. Seeing what you have will prevent you from buying 5 red lipsticks and 7 pink nail polishes that you just don’t need. The first thing to do is to take every single beauty item you own and lay it out in front of you. Start organizing the items into categories: hair care, skin care, makeup, etc. As you are going through each item, check the expiration date and the quality of each one. 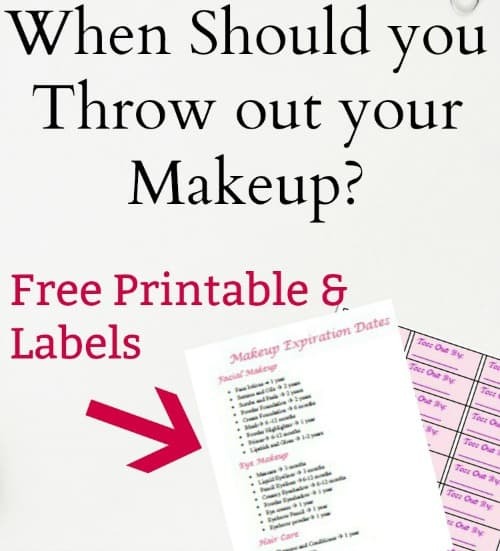 If the makeup is crumbly or smells bad, toss it. Check to see if the color of your nail polish has separated in the bottle. If it has then get rid of it. You don’t want to waste time using items that are past their prime. The formulas will not go on smoothly and won’t last the way that they should. If you haven’t used a product within the last 6 months, just get rid of it. You can grab this free printable that gives you the exact shelf life of each of your products. It even has little stickers that you can apply to each product so you can write down the date that it was opened. This will make things go faster the next time you clean and organize your beauty products. As you are checking the quality of your makeup brushes, go ahead and clean them all at once. I like using this DIY makeup brush cleaner to save money and get the job done. Take everything that you will be keeping and organize it into subcategories. Put all of the lipsticks together, the mascaras together, skin care together, etc. Go through each subcategory and get rid of any duplicates that you may have. Do you really need 5 red lipsticks or 4 pink blushes? If you know that you will use them before they expire, that is fine. Just be honest with yourself to help clean up some storage space. I like to then go through and put everything that I use daily and gather them together on the counter. Everything else will be put in drawers. All of my daily makeup, skin care, and makeup brushes will be stored on my counter. You can use a pretty tray or some cute makeup organizers to keep everything together. I’m a big fan of the carousel organizers because they take up less space. Everything else needs to be stored in drawers. Invest in some drawer dividers in different sizes to keep everything in one place. If you have to store skincare products, make sure they are kept in a cool, dark place. If they are kept out in the sunlight, the active ingredients could become inactive. Storing them in a closet is best. For hair care products, you can store them underneath the sink. If you have a lot of them, you may want to keep them in a rolling storage cart under the bed. 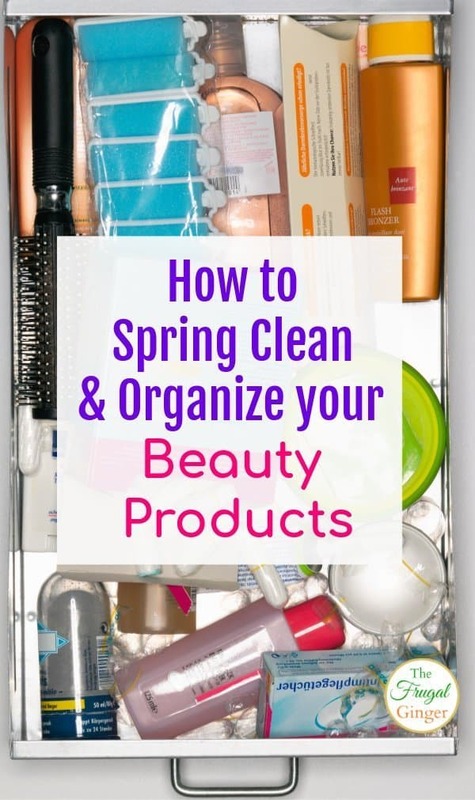 By taking the time to spring clean and organize your beauty products, you will know exactly what you have and will actually be able to find it.